Amongst the many lookalike species of butterflies in Singapore and Malaysia, this genus is probably one of the most challenging to identify. There are over 80 species in Malaysia alone, and more species are still being described from time to time. 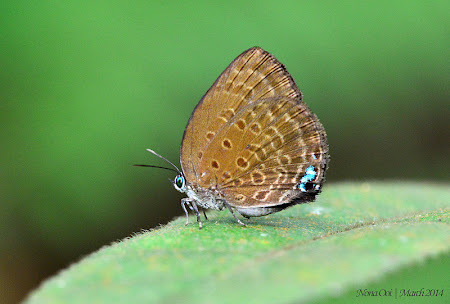 Although we have recorded only 16 species of Arhopala in Singapore, it is without doubt that there are more that have yet to be confidently identified and recorded. Amongst the Arhopalas that are found in Singapore, this species, Arhopala amphimuta amphimuta is relatively common and several individuals can often be found in the same location. This species can easily be confused with the very similar looking Arhopala major major. The distinguishing V-shaped spot in A. amphimuta at the post-discal area of the hindwing generally separates the two species. The caterpillars of this species feed on Macaranga bancana and often in the company of ants. This individual was shot by ButterflyCircle member Nona Ooi. Your statement that this is one of the most challenging to identify is so true! I don't think any other species has ever given me such a difficult time to identify, and I never felt completely confident that I got it right!